At Cannon West Interior Design we listen to your ideas and create a design that complements your lifestyle. This could mean giving a tired room or whole house a completely new look including lighting, wallpaper, curtains, flooring and furniture. 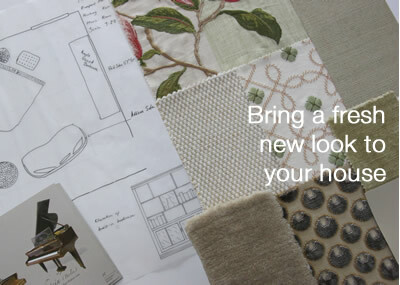 If you need a pair of new curtains or want to reupholster a chair or sofa, you can visit our showroom and we'll help you choose exactly the right fabric and trimmings. Want to know more about hiring an interior designer? 1 First of all we'll meet at your home to discuss your requirements and budget. 2 Next we'll research and create a design concept and theme that will form the foundations for your scheme. Once you’ve approved this, we'll provide scale drawings showing your furniture layout, and show you sample and illustration boards. These have actual samples of the recommended materials and finishes ie. fabric, wallpaper paint, rugs, flooring, and visuals of the furniture, lighting and accessories. 3 We present the design proposals to you. Together we will discuss and finalise these until you are completely happy with them. The project can be partially or completely managed by Cannon West Interior Design or by your own team of builders and decorators. As part of our service we arrange all the orders and deliveries for you.